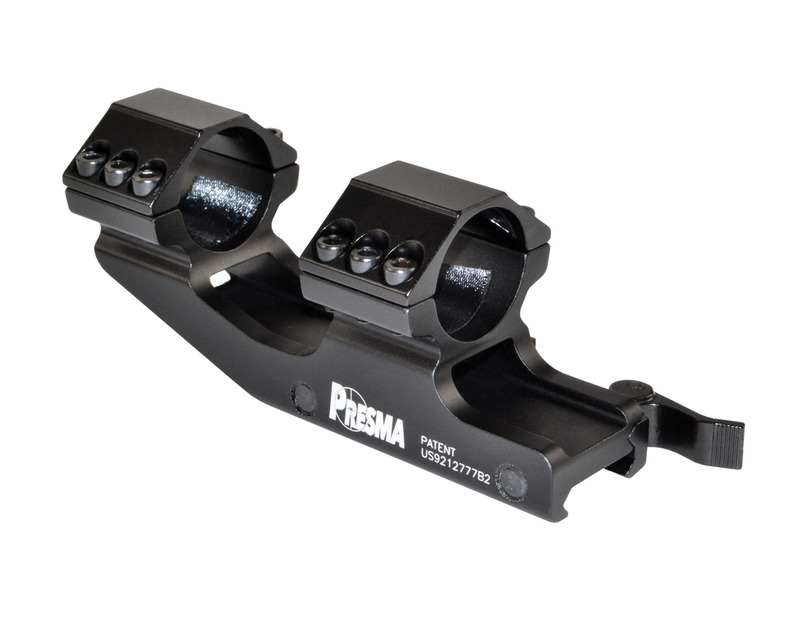 Presma® Wing Series, 1” Quick Release Button Cantilever Integrated Scope Rings for Picatinny/Weaver Rail; High Profile. Presma® Wing Series Scope Ring is made of aircraft grade aluminum alloy. Machined precisely by CNC. Center lung machined to places. It will fit 1913 picatinny Mil spec rails and mounts. It has a quick release button attached to secure the rail, along with 6 screws to fasten upper and lower half of the scope ring firmly. Integrated see-through hole, designed to be used as a front sight if necessary. 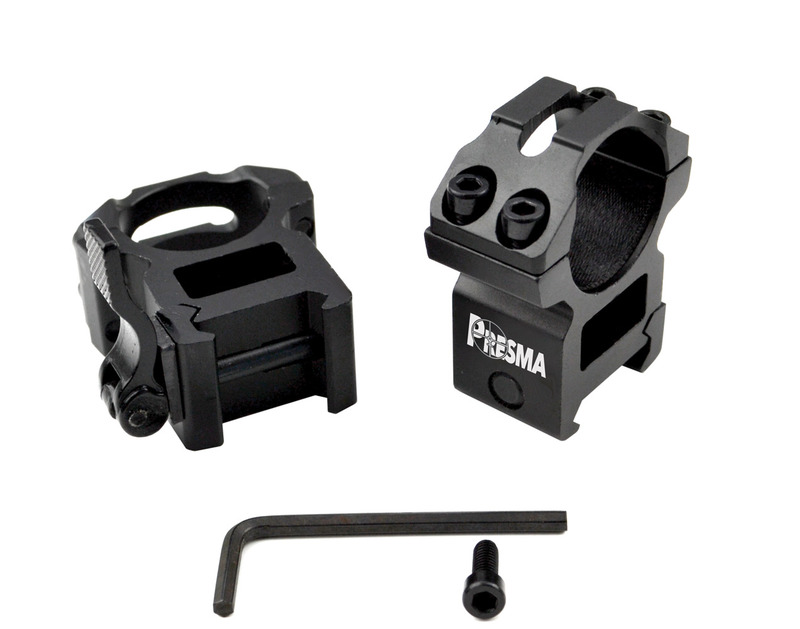 Presma® Wing Series, 1” Quick Release Button Cantilever Integrated Scope Rings for Picatinny/Weaver Rail; Medium Profile. Presma® Wing Series Scope Ring is made of aircraft grade aluminum alloy. Machined precisely by CNC. Center lung machined to places. It will fit 1913 picatinny Mil spec rails and mounts. It has a quick release button attached to secure the rail, along with 6 screws to fasten upper and lower half of the scope ring firmly. Integrated see-through hole, designed to be used as a front sight if necessary. 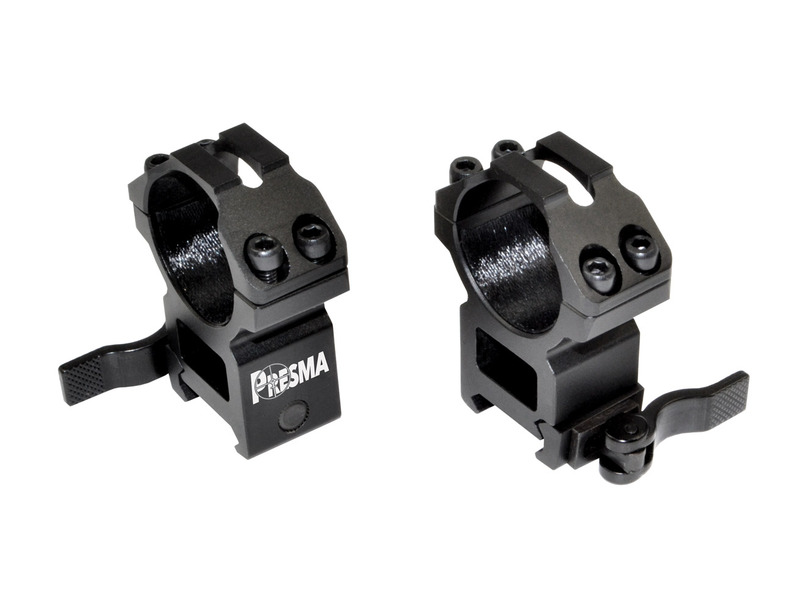 Presma® Wing Series, 1” Quick Release Button High Profile Scope Rings for Picatinny/Weaver Rail; 4 screws for best results. Presma® Wing Series Scope Ring is made of aircraft grade aluminum alloy. Machined precisely by CNC. Center lung machined to places. It will fit 1913 picatinny Mil spec rails and mounts. It has a quick release button attached to secure the rail, along with 4 screws to fasten upper and lower half of the scope ring firmly. The bottom of the ring has a see-through hole, designed to be used as a front sight if necessary. Presma® Wing Series, 1” Quick Release Button Medium Profile Scope Rings for Picatinny/Weaver Rail; 4 screws for best results. Presma® Wing Series Scope Ring is made of aircraft grade aluminum alloy. Machined precisely by CNC. Center lung machined to places. It will fit 1913 picatinny Mil spec rails and mounts. It has a quick release button attached to secure the rail, along with 4 screws to fasten upper and lower half of the scope ring firmly. The bottom of the ring has a see-through hole, designed to be used as a front sight if necessary. Presma® Wing Series, 30 mm Quick Release Button Cantilever Integrated Scope Rings for Picatinny/Weaver Rail; 6 screws for best results, Medium Profile. Presma® Wing Series Scope Ring is made of aircraft grade aluminum alloy. Machined precisely by CNC. Center lung machined to places. It will fit 1913 picatinny Mil spec rails and mounts. It has a quick release button attached to secure the rail, along with 6 screws to fasten upper and lower half of the scope ring firmly. Integrated see-through hole, designed to be used as a front sight if necessary. 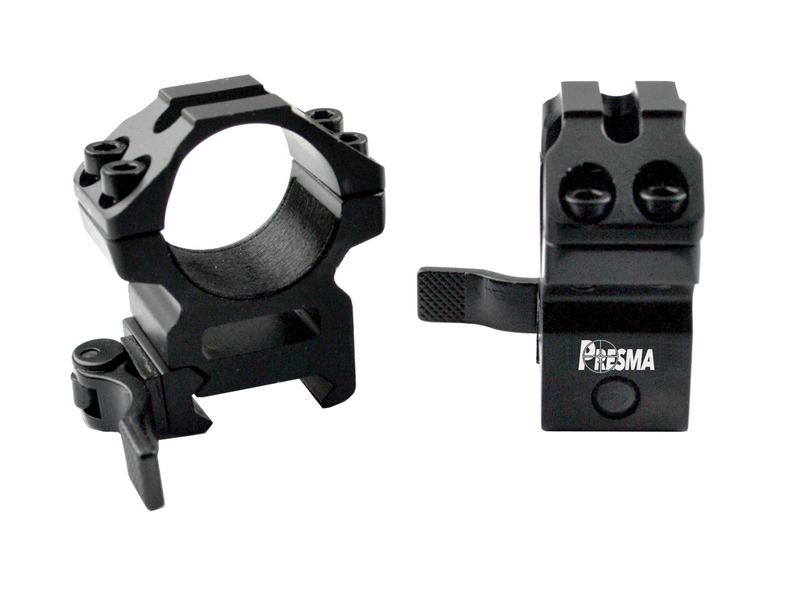 Presma® Wing Series, 30 mm Quick Release Button High Profile Scope Rings for Picatinny/Weaver Rail; 4 screws for best results. Presma® Wing Series Scope Ring is made of aircraft grade aluminum alloy. Machined precisely by CNC. Center lung machined to places. It will fit 1913 picatinny Mil spec rails and mounts. It has a quick release button attached to secure the rail, along with 4 screws to fasten upper and lower half of the scope ring firmly. The bottom of the ring has a see-through hole, designed to be used as a front sight if necessary. Presma® Wing Series, 30 mm Quick Release Button Medium Profile Scope Rings for Picatinny/Weaver Rail; 4 screws for best results. Presma® Wing Series Scope Ring is made of aircraft grade aluminum alloy. Machined precisely by CNC. Center lung machined to places. It will fit 1913 picatinny Mil spec rails and mounts. It has a quick release button attached to secure the rail, along with 4 screws to fasten upper and lower half of the scope ring firmly. The bottom of the ring has a see-through hole, designed to be used as a front sight if necessary. 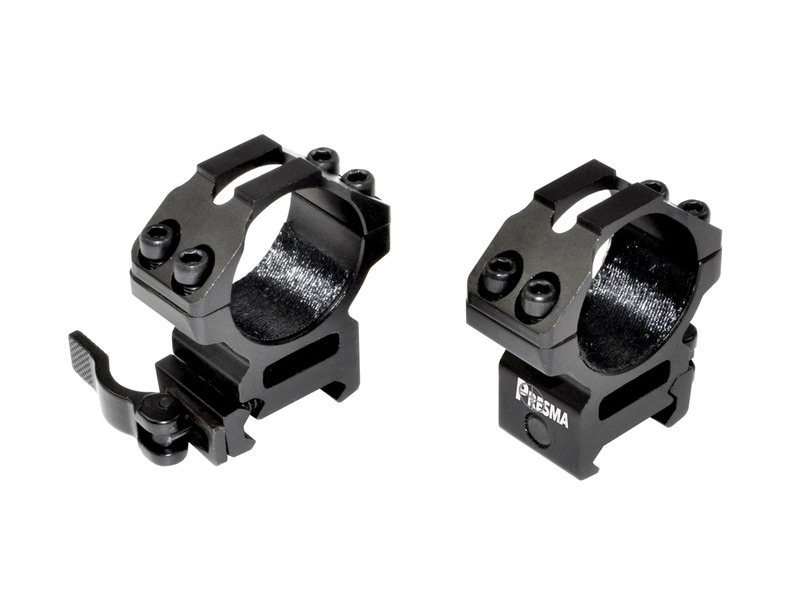 Presma® Wing Series, 35 mm Quick Release Button Cantilever Integrated Scope Rings for Picatinny/Weaver Rail; 6 screws for best results, High Profile. Presma® Wing Series Scope Ring is made of aircraft grade aluminum alloy. Machined precisely by CNC. Center lung machined to places. It will fit 1913 picatinny Mil spec rails and mounts. It has a quick release button attached to secure the rail, along with 6 screws to fasten upper and lower half of the scope ring firmly. Integrated see-through hole, designed to be used as a front sight if necessary.